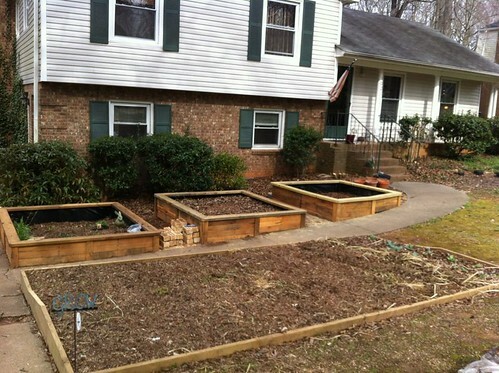 Remember when I was braggin' on my bro's amazing gardening project? I don't know if it's the early emergence of spring that got him going, or the profusion of food-based documentaries available for instant streaming, but his front yard is quickly becoming a beautiful little farm. Todd's been sitting down after work each night disassembling pallets to re-use as raised beds. The details give them a beautiful sort of craftsman style. These beds are his newest garden addition and equal about 1/2 of their total vegetable production space. The middle rear square bed has been planted with potatoes. As far as my handiwork? I've been great at buying plants, but that's about it for pretty stuff. I've started 2 new compost bins and cleaned up a few areas that were knee deep in leaves so we can hang swings and make play areas for the little one. The changes, so far, are very unexciting visually. 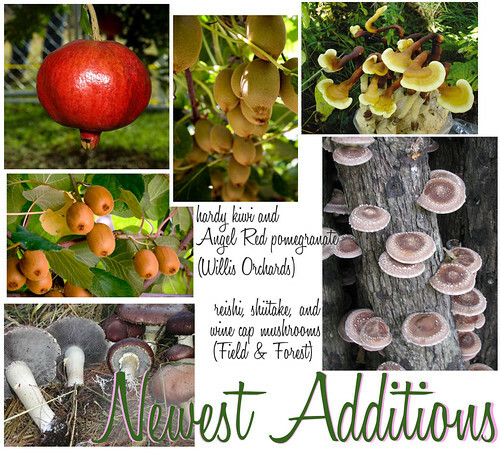 I have gotten a few new food plants as you can see above, including kiwi, pomegranate and mushrooms. I've also gotten my first kiss of sun on my nose, ant bites on my arms and neck, and a few ouchy little blisters. Although I'm reluctant to say, it seems spring is really here.